Rawda Apartments ... by Nshama. 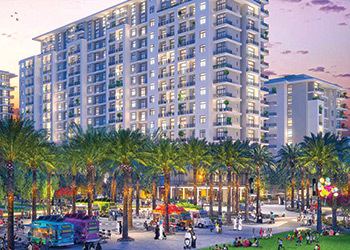 UAE developer Nshama has launched a collection of affordable apartments for middle income families – Rawda Apartments – that are defined by their location on the central Town Square Park in Dubai, UAE. This comes following the success of its 31-million-sq-ft trendy development Town Square, which is set for the first delivery of ‘Live life at your price’ homes later this year, says the company. Town Square has already made commendable progress with the network of roads completed and work on swimming pools and landscaping progressing. The Town Square Park, the size of 11 football fields, is also coming to life and will feature the Vida Townsquare hotel and a Reel Cinemas cineplex. Residents in Rawda and other residential projects can also enjoy a 2.5-million-sq-ft retail precinct featuring over 600 stores and F&B (food and beverage) outlets. According to Nshama, Rawda will offer a wide range of amenities for residents including access to swimming pool, children’s pool, modern gymnasium, changing areas, showers, common area, kids’ playground and game areas. All apartments are thoughtfully designed with modern fittings and elegant interiors. The layout of the homes maximise views of the park and boulevard. The new Rawda Apartments are set apart by their central location in the heart of the neighbourhood with spectacular views of the Town Square Park, Courtyard and Town Square Boulevard. Rawda features one-, two- and three-bedroom apartments in average sizes of 600 sq ft, 850 sq ft and 1,300 sq ft, respectively, in four residential buildings. Town Square is situated near Al Barsha, in proximity to popular malls.